St. Benedict framed a Rule, or	constitution, which was modelled in some respects upon the earlier Rule of	St. Basil for the Benedictine Order in 529AD. The Medieval Benedictine Monks formed a sort of corporation, presided over by an	abbot, who held the office for life. Every candidate for	admission to the order of the Medieval Benedictine Monks took the vow of obedience. Any man, rich or poor, noble or	peasant, might enter the Benedictine monastery. The postulancy usually lasted one month, the novitiate one year, at the end which simple vows were taken. The solemn vows of the Medieval monks were taken four years later. But having once	joined he remained a Benedictine monk for the rest of his life. The Benedictine monks	lived under strict discipline. They could not own any property;	they could not go beyond the monastery walls without the abbot's consent;	they could not even receive letters from home; and they were sent to bed	early. A violation of the regulations by a Benedictine monk brought punishment in the shape of	private admonitions, exclusion from common prayer, and, in extreme cases,	expulsion. These vows were the basis of the rule of St. Benedict and the life of the Medieval Benedictine Monks. By the tenth century the Benedictine Rule prevailed everywhere in western Europe including England. The life and work of the Medieval Benedictine Monks in a monastic community. St. Benedict sought to draw a sharp line between the monastic life and	that of the outside world. Hence he required that, as far as possible,	each monastery should form an independent, self-supporting community whose	Medieval Benedictine Monks had no need of going beyond its limits for anything. In course of	time, as a monastery increased in wealth and number of inmates, it might	come to form an enormous establishment, covering many acres and presenting	within its massive walls the appearance of a fortified town. St. Benedict defined a monastery as "a school for the service of the Lord." The Benedictine monks under his Rule occupied themselves with a regular round of worship, reading, and manual labor. Each day was divided into seven sacred offices, beginning and ending with services in the monastery church. The first service came usually about two o'clock in the morning; the last, just as evening set in, before the Medieval Benedictine Monks retired to rest. In addition to their attendance at church, the monks spent several hours in reading from the Bible, private prayer, and meditation. For most of the day, however, they worked hard with their hands, doing the necessary washing and cooking for the monastery, raising the necessary supplies of vegetables and grain, and performing all the other tasks required to maintain a large establishment. This emphasis on labor, as a religious duty, was a characteristic feature of western monasticism. "To labor is to pray" became a favorite motto of the Medieval Benedictine Monks. It is clear that life in a Benedictine monastery appealed to many different kinds of people in Medieval Times. Those of a spiritual turn of mind found in the monastic life the opportunity of giving themselves wholly to God as Benedictine monks. Studious and thoughtful persons, with no disposition for an active career in the world, naturally turned to the monastery as a secure retreat and joined the ranks of the Medieval Benedictine Monks. The friendless and the disgraced often took refuge within the walls of a Benedictine monastery. Many sought to escape from the violent world of the Medieval Middle Ages by seeking the peaceful shelter of the monastery and leading the quiet life of a Benedictine monk. 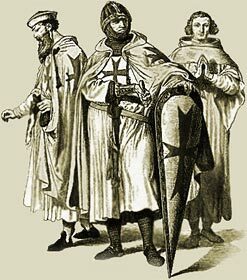 The Medieval Times website provides interesting facts, history and information about these great people and important historical events which scatter the Medieval History books including Medieval Benedictine Monks. The Medieval Times Sitemap provides full details of all of the information and facts about the fascinating subject of the lives of the people who lived during the historical period of the Middle Ages. The content of this article on Medieval life and times provides free educational details, facts and information for reference and research for schools, colleges and homework for history courses and history coursework.